We learned a few things as we crossed the ridge south of camp. For one thing, our traverse southwest to Donohue Pass would be less time-saving than we had hoped, since to get on a good bench for the traverse we would be immediately below Lost Lakes Pass, our other potential path to the Muir Trail. Another thing we swiftly learned was that water was indeed plentiful here, just not clearly visible from last night's angle. 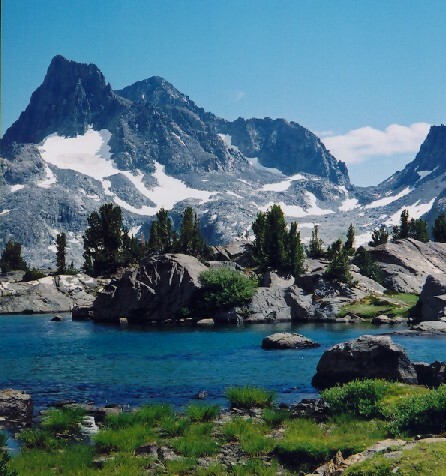 We decided to take the (apparently) more direct way south and angled toward Lost Lakes Pass, crossing a perfect Sierra landscape of water, flowers, small whitebark pines and a stunning backdrop (Lyell &c) beneath a wispy cirrus-streaked sky. The left-side pass had a snowfield that Larry and Scott took to gratefully, while I steered toward the more westerly, snow-free gap. The view was impressive, reaching deep into the central Sierra to the south (including my old friend Mt. Goddard which I had seen up close for three consecutive years), while Banner Peak and Mt. Ritter punctured the skyline at close range. I navigated easy class-two ledges for about fifteen minutes before rejoining the other two for a brief break. The way down to the Lost Lakes was simple enough, and this stretch of land was as impressive as the other side had been. Then we reached the outlet of the lower lake and pondered our future. It didn't look good. We were staring down sheer granite slabs inclined at something close to 40 degrees, with minimal handholds and few cracks. After a couple hundred feet the going would get easy again, but that was irrelevant for the next twenty minutes! We pulled out maps and plotted our way to the Muir Trail, but our focus was still much closer than those three miles. We slithered gently downward, then gratefully followed the creek as it led us back toward genuine trails. After a good while, though, we met nothing, and pulling out the maps we noted with dismay that our creek was veering south to hit Waugh Lake and the Rush Creek trail - and so were we! Rather than get greedy, we accepted this alternate route and worked our way downhill, the reservoir now visible through the trees. We traversed one particularly nasty 30-foot stretch (needlessly, as it turned out) and reached the trail. Relieved that we no longer had to think about the route, we headed west and encountered a group of men and dogs going our way. 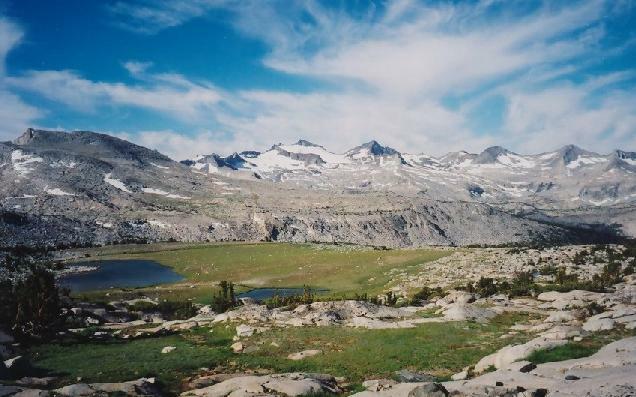 We soon reached the John Muir Trail and took a break, letting them take the lead toward Island Pass. The distance passed swiftly (while we looked back toward the Lost Lakes and wondered "did we really do that?? 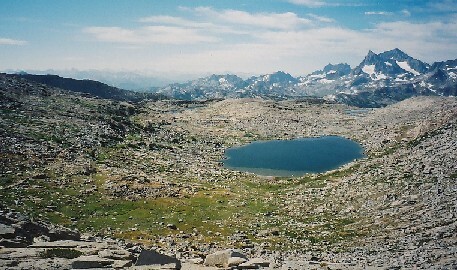 "), and soon we were passing through a gorgeous scene of tarns and wildflowers. Suddenly we were at the pass - one final tarn framing the Banner-Ritter group in all its glory! We shot the scene and relaxed, preparing ourselves for the long stretch of off-trail travel that awaited us. The pass at Lake Catherine was visible from here, and while it didn't look very intimidating after what we had already done it was clearly no cakewalk (and didn't cake sound good right about now?). We began again and soon left the trail, seeking good water and a fine perch from which to attack the pass early the next day. We ended up above Thousand Island Lake near its twin inlet streams, and a bit of searching found enough space for small tents near a slow-moving stretch of creek. The sun was nearly behind the cliffs of Mt. Davis, and while the others set up tents I did a quick jump in the creek, giving the sun sufficient time to dry and warm me. I again chose to skip the shelter for the night, and just after dark I remembered the bug-net; when I returned for it I saw Larry setting up his camera, shooting the Moon as it neared Banner Peak (a magnificent tower from our camp). I grabbed my camera and got off a quick shot before retreating to bed for a great night's sleep, bugged by far less bugs than the first night. use hikebar to return to page one..